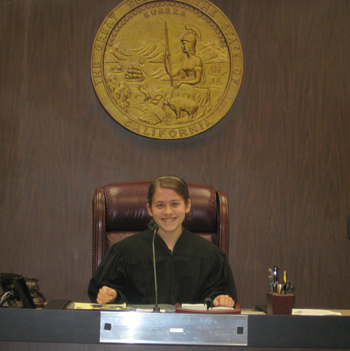 Photo of the Week: Eighth Grader Kayla B., presides over a mock trial at the Superior Court of California, North Justice Center. The 8th graders visited the North Justice Center in Fullerton and witnessed first-hand the administration of justice. They observed actual court proceedings, visited the jury assembly room, glimpsed the inmates' intake and holding areas, met representatives of the District Attorney's office and the Sherriff's Department. Our eighth graders then participated in a scripted mock trial with the objective of teaching the students the role of various participants in a courtroom setting (judge, attorney, witness, baliff, clerk, etc). They then met with a judicial officer to talk to the students about the legal consequences of one's actions. Congratulations to all the participants in the 4th grade spelling bee. Spring portraits will be taken of ALL students. Please dress your child in the clothes you would like them to wear for this spring photograph! In a few weeks Lifetouch will be sending a package of the pictures home with your child, and you may purchase the entire package or 1-4 sheets of the pictures, and then RETURN the pictures you are not interested in purchasing. The Anaheim Hills campus won the top individual honor "Golden Gavel" for the fourth straight tournament! In the team division they won first, second, and fourth place! 1 Anaheim Hills CLT Nicky C., Lauren Lee., Sabrina T.
2 Anaheim Hills KCP Yvonne K., River C., Sassoon P.
3 Edgewood FMC Nick F., Amanda M., Amanda C.
4 Anaheim Hills PWJ Kyle P., Emily W., Alice J. Our Third Graders can also recognize famous masterworks by great composers. They also improvised dance movements that reflected a specific pattern by Beethoven. For the last two weeks they have been choreographing a complicated dance to music by Saint-Saens' work, "Danse Macabre". On March 31, the Third Graders showed that they are becoming literate musicians. They did the following things in 6/8 meter: play instruments to the beat, use the Gordon Rhythmic System to read and speak rhythms, dictate rhythms, and learned to listen critically to discern one rhythm from many other rhythms.